Observed on leaves of a morning-glory, convolvulaceae, near the Kerio River, Rift Valley, Kenya. 7 October 2010. 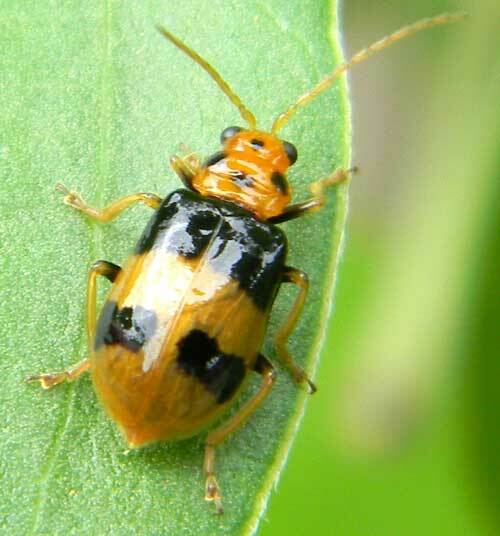 Leaf Beetles chew on the leaves of plants often in exposed areas where birds or lizards could easily predate them. Many leaf beetles are also brightly colored, which should make them even easier to see and capture. However, many are laced with repelant compounds derived from the plants and are thus protected from many insectivores. When abundant, leaf beetles in the subfamily Galerucinae will eat all the plant tissue between leaf veins thus leaving a skeleton of the leaf. Some are pests of agricultural crops. This one was found in a semi-arid habitat near Chebloch Gorge along the Kerio River in Kenya.